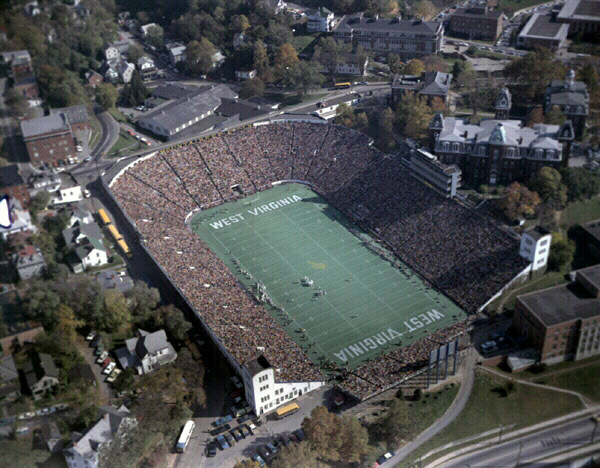 A knitting blog with a photo of old Mountaineer field? What does college football have to do with knitting? On the surface, nothing. But dig a little deeper and you will find the connection. I love college football. I love knitting. So from the end of August until the BCS championship game in January, I spend a lot of time knitting and watching college football. It’s genetic. Want proof for that assertion? My grown-up son went to my mother’s house to watch college football one Saturday. He called me from there and I asked him what Grandma was doing. He said She’s doing the same thing you are, knitting and watching football. So far the college bowl season has been exciting and entertaining–lots of close games and exciting finishes. Football watching requires relatively mindless knitting, so I have been working on socks and a simple lace moebius scarf. KISS is the rule for combining football and knitting. I’ll put more knitting content in subsequent entries. I promise. Maybe I’ll even include some pix of WIPs.